Hello my darlings! I am thrilled to share the news about my recent release, a scorching Highland Romp titled Susana and the Scot. I had a bucket list of things I wanted to do and I am pleased to say I accomplished them all! Here are my top 5! #5 TRY HAGGIS. I’ve heard so much about it. We all have. I just HAD to try it. Here is the picture of me with it. I’ll let you decide if you think I enjoyed it! #4 GO ON A TRAIN RIDE. I have always been in love with the romance of train rides! 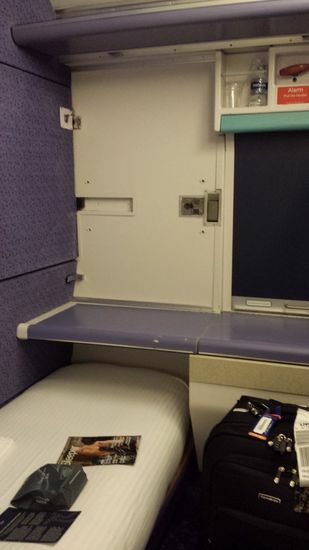 We took the sleeper train from London to Inverness and it was a blast! Here is a picture of my ENORMOUS berth! #3 HIGH TEA. Oh yes. This was awesome! 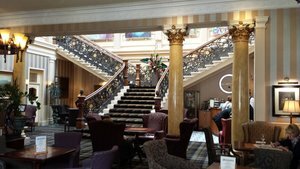 We had a lovely tea in the lobby of the Grand Highland Hotel! So elegant! #2 VISIT THE VILLAIGE MY MOTHER’S FAMILY CAME FROM. Yes! I loved checking this off my list. It was a tiny village with a stone church, a grocery store and a café. 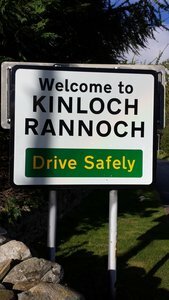 I loved meeting the people and exploring this tiny villaige nestled between Loch Rannoch and the Rannoch moors! The village will feature prominently in my next Highland series! #1 FIND THE END OF THE RAINBOW. I know it’s more of an Irish thing, but let’s be real. Finding the end of the rainbow is a worldwide fantasy! 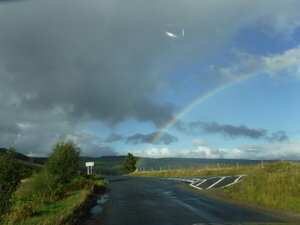 Though it rained when we were in Scotland, somehow the sun also shone. There were rainbows everywhere and here, on this one lane road, we actually found the end of the rainbow! There was no treasure, but there was great beauty! I had a wonderful time on my trip. I loved every moment. But what I loved most was connecting with the lands and the people. I have always had a passion for Highlanders, but now I feel I KNOW them! If you love Highlanders, please check out my Untamed Highlanders! Susana was annoyed. There was no doubt about it. The swish of her hips as she led him across the bustling bailey was a dead giveaway, that and the dark glowers she shot over her shoulder. But Andrew couldn’t help but be amused. For one thing, she was damn alluring when she was annoyed. Hell, she was damn alluring altogether. The curve of her waist alone could drive a man insane, much less that silky tumble of hair. He wanted to wrap it in his fist, wind it around his body. A certain part of his body. This entry was posted on Monday, January 4th, 2016 at 6:00 am in General. Tagged: Guest Blogger. You can feed this entry. Both comments and pings are currently closed. Wow you were busy in 2015. And, to do all those special things—I can’t imagine. I would definitely enjoy High Tea at The Grand Hotel. The train ride would be interesting as I’ve never rode on a train and definitely the end of a rainbow. Such excitement. I enjoyed reading the excerpt for Susana and the Scot. Thank you for sharing your adventures, your book and of yourself. Thank you Ginger! It was a wonderful trip. But now I want to go back again!!! Delilah, thank you so much for sharing! LOL Deb! You know it!!! Haggis that has been breaded and fried. I doubt it makes any difference. Not even the sweet dipping sauce helped. Apparently Haggis is made from meat with very powerful flavors, so it is heavily spiced. It was the spices that made me grimace so..
Incidentally, my husband LOVED Haggis. But then, he loves olives too. I am a fan of neither! 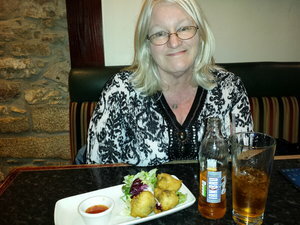 I enjoyed vicariously visiting Scotland with you Sabrina! How fun! I look forward to all the books that come out of that trip! Thank you for sharing it.